For over 25 years, US Bank Tower was the tallest skyscraper in Los Angeles, with a height of over 300 meters or 1.0k ft.. Opened in 1989 as Library Tower, the 73 story building reaches a height of 310 meters (just over 1.0k ft.). In 2017, the circular tower was eclipsed by the (also 73 floor) Wilshire Grand Center, which topped out at over 335 meters (about 1.1k ft.). In this drone video by AerialClip, you'll get some epic views of the older building as well as the usurper as it was being completed. 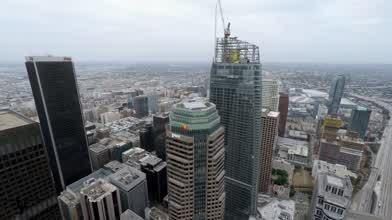 Description: There is a lot of construction going on in Downtown L.A. right now. Thought it would be the perfect time to take a drive down and get some aerial footage.